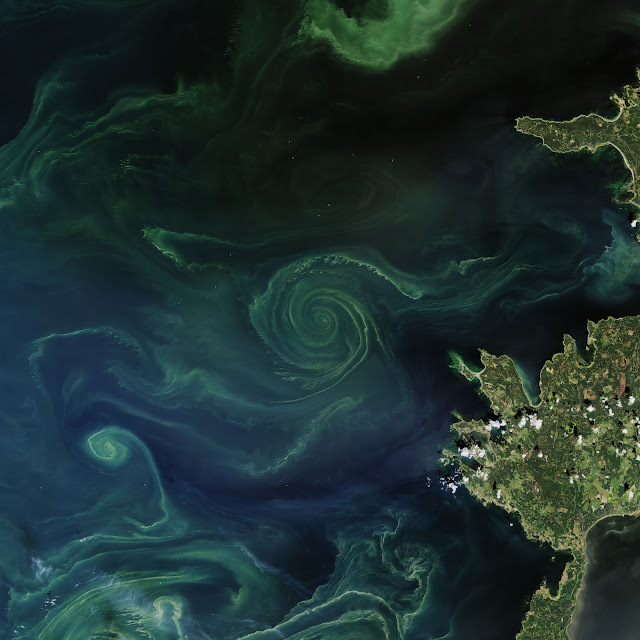 Image: Wide view of phytoplankton and blue-green algae blooms off of Scandinavia. They seem to be particularly intense this summer. 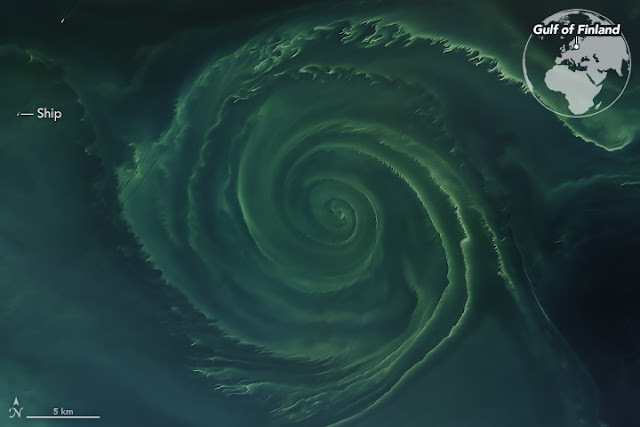 On July 18, 2018, the Operational Land Imager (OLI) on Landsat 8 acquired a natural-color image (above) of a swirling green phytoplankton bloom in the Gulf of Finland, a section of the Baltic Sea. Note how the phytoplankton trace the edges of a vortex; it is possible that this ocean eddy is pumping up nutrients from the depths. Though it is impossible to know the genus and species without sampling the water, three decades of satellite observations suggest that these green blooms are likely to be cyanobacteria (blue-green algae), an ancient type of marine bacteria that capture and store solar energy through photosynthesis (like plants). Some of the greens also could come from diatoms, which are also rich in chlorophyll. According to news outlets, the Finnish Environment Institute (SYKE) has observed the recent bloom from the water and found it to be mostly cyanobacteria. In recent years, the proliferation of algae blooms in the Baltic Sea has led to the regular appearance of “dead zones” in the basin. Phytoplankton and cyanobacteria consume the abundant nutrients in the Baltic—fueled largely by runoff from sewage and agriculture—and reproduce in such vast numbers that their growth and decay deplete the oxygen content of the water. According to researchers from Finland’s University of Turku, the dead zone this year is estimated to span about 70,000 square kilometers. The Gulf of Finland is the easternmost arm of the Baltic Sea. It extends between Finland (to the north) and Estonia (to the south) all the way to Saint Petersburg in Russia, where the river Neva drains into it.